Access to join a local group or watch the lessons from home—your choice! Extra Benefits Along the Way (We'll Continue to Enrich Your Journey to Financial Peace As You Go! The best way to jump-start your financial journey is to join an in-person group and work the program with other people. Groups typically meet for 90 minutes once a week for nine weeks and are led by a volunteer coordinator. Yet, we also understand that life is super busy and you might not be able to meet with others once a week. We provide an online option so you can go through the course at home on your own time. When you start your membership, you get immediate access to your online account. Your account includes all video lessons, digital tools like the Debt Snowball Tool and Emergency Fund Planner, exclusive access to our online community and financial coaches. Four newly updated lessons coming soon! Be the first to get access. 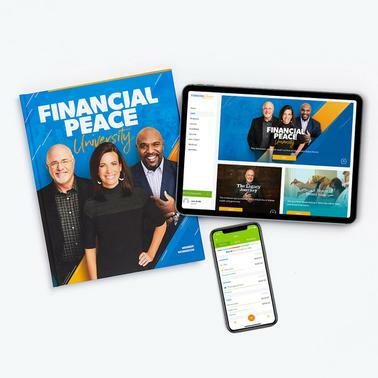 Track spending and save money—anytime, anywhere—with EveryDollar Plus, the premium version of our budgeting tool designed for Financial Peace University. From your phone, you can create a budget, connect that budget straight to your bank and stay informed of your purchases with one quick glance. We'll send your member workbook straight to your door! The workbook follows the lessons and helps you stay engaged throughout the course.